First, the Round, which is the least aggressive of the three types, “peens” the surface. This type also looks closest to a ball. A smooth, rolling profile does not help this in efficacy in coating removal. It is however low in dust and embedment. Good examples of this shape is: steel shot, glass beads, and plastic beads. Second, the Sub-Angular is more aggressive than round and it’s angular profile gives it a little more dust and embedment, but still low to mid. Good examples of this shape is: Powerblast and Alluvial Garnet. 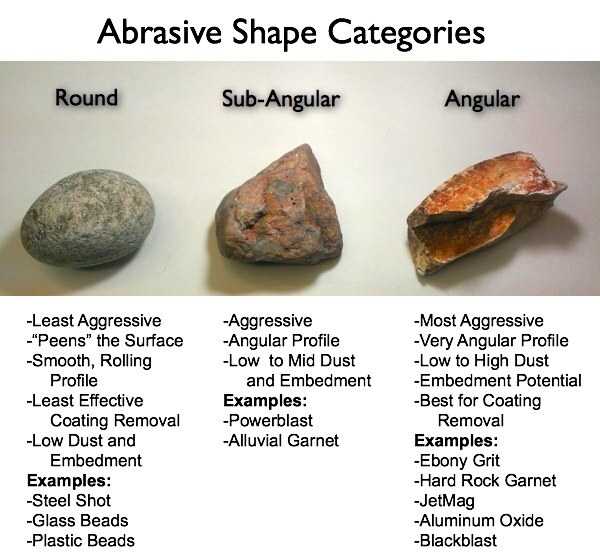 Third, the Angular is the most aggressive of the three types but the very angular profile leads to a broad range of dust potential as well as high embedment potential. This type would be best for coating removal. Good examples of this shape: Ebony Grit, Hard Rock Garnet, JetMag, Aluminum Oxide, and Black Max.